In this charming companion to the award-winning picture book Strictly No Elephants, a tiny narwhal discovers that sometimes the difference between staying home and a big adventure is a group of loving friends. Red front door. Potted plant. Umbrella stand. Piano. Red front door. Potted plant. Umbrella stand. Piano. That’s what the world looks like from inside Tiny Narwhal’s fishbowl. It’s not very exciting. She dreams of the world beyond: endless blue sky, tall buildings, a bridge. But Tiny Narwhal hasn’t any feet and doesn’t know the street names. And what if it’s cold outside? What this little narwhal does have, though, are good friends. With the help of her boy and his friends, plus a penguin, bat, and giraffe, Tiny Narwhal finally feels brave enough to go on an adventure. 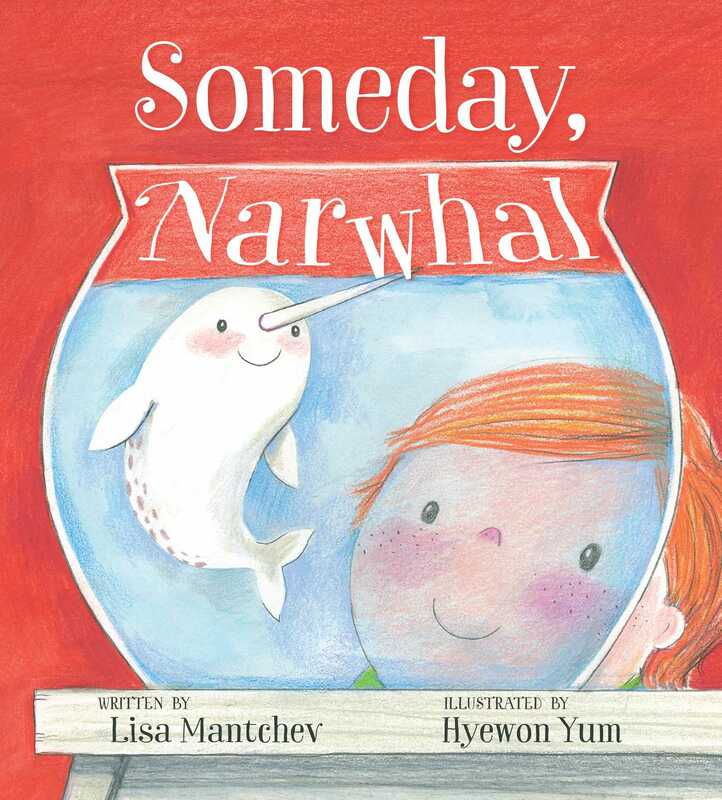 Someday, Narwhal features the same adorable cast of pets and sweet, lyrical language as Lisa Mantchev’s beloved Strictly No Elephants. 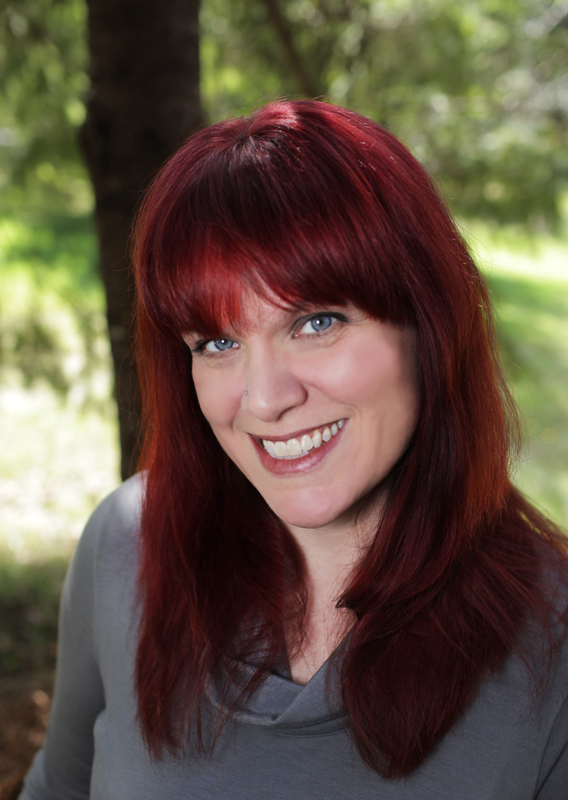 Lisa Mantchev is the author of many picture books, including Strictly No Elephants, which garnered awards and rave reviews and is published in fourteen countries. The New York Times called it “a sunny, smart, tongue-in-cheek tale.” Her latest, Jinx and the Doom Fight Crime!, received a starred review from Kirkus Reviews: “Jinx and the Doom Fight Crime! will captivate readers with their irresistible fun.” Lisa lives on the Olympic Peninsula of Washington state with her family. Visit her website at LisaMantchev.com. Hyewon Yum is the author and illustrator of Puddle; The Twins’ Little Sister; Last Night, a Fiction Honorable Mention for the Bologna Ragazzi award and winner of the Golden Kite Award; There Are No Scary Wolves, winner of Society of Illustrators’ Founder’s Award; The Twins’ Blanket, a Junior Library Guild selection; and Mom, It’s My First Day of Kindergarten!, which won the Ezra Jack Keats New Illustrator Award and was selected as a Kirkus Reviews Best Book of the Year. Hyewon’s latest, A Piece of Home, written by Jeri Watts, received multiple starred reviews. Hyewon lives in Brooklyn, New York. Learn more at HyewonYum.com. A tiny narwhal dreams of seeing the world beyond her fishbowl.The little white narwhal's entire universe seems to be an endless circle: the red front door, potted plant, umbrella stand, piano, and back to the red front door. She wants to travel, but she is worried about obstacles. She can't walk, is afraid of getting lost, and doesn't want to get cold. The little white boy who lives outside the bowl sympathizes. His diverse group of friends and their accompanying animals—a penguin, a giraffe, and a bat—are eager to help. They come up with a plan to wheel her through the neighborhood in a little red wagon, and off they go. She is thrilled with everything she sees, especially travel posters that hint of an even wider world. Mantchev keeps the tone simple and innocent, filled with wonder. The friends, both human and animal, are kind and encouraging in words and deeds. Yum's childlike, softly hued, colored-pencil-and-gouache drawings complement the sweetness of the tale. Bravery and cooperation are at the story’s heart; Mantchev concentrates on the way the friends listen to the narwhal’s concerns and how she responds. . . . Yum brings all of this to life with plenty of color and lively action, using distortion to distinguish the narwhal’s perspective from inside the bowl. Mantchev’s tale also implies that some friends have physical conditions that make help from others necessary—good for post-readaloud discussion. The little narwhal from Strictly No Elephants gets her own story and it starts out relatively short. “The world doesn’t look very exciting from inside a fishbowl. Red front door. Potted plant. Umbrella stand. Piano.” Repeat. However, she dreams of seeing the big, wide world beyond her fishbowl. If only she had feet! One day, her boy brings home his friends and their pets, and together they come up with a plan to make the little narwhal’s dreams come true. As in the first story, there is a sweetness and simplicity to the tiny animal’s dilemma and to her friends’ solution. The colored pencil and gouache illustrations depict characters with a variety of skin tones; both human and animal faces are wonderfully expressive. VERDICT Equally good as a stand-alone or for fans of the first book. Yum’s illustrations are rendered in colored pencils and gouache, and make the white, purple-spotted narwhal pretty adorable. Kids will love this tiny little protagonist who dares to dream big. fishbowls have a lot of dreams”), he becomes concerned and calls up some friends to come over to cheer her up. Three children arrive, accompanied by their own unusual pets—giraffe, penguin, and bat. The animals and children decide to take the narwhal on a little adventure and put her bowl into a red wagon for a walk to town. Throughout, Yum’s cheery colored-pencil and gouache palette allows the cartoon-style illustrations a levity that mitigates any sense of tragic captivity, but text and art combine to establish the limitations on the narwhal’s outlook; one spread adopts a skewed, rounded visual perspective that emulates the narwhal’s point of view, which supports the reader’s sympathy for her plight. Although Mantchev eschews a Free Willy sort of ending, returning the narwhal in her bowl back to the house with the boy, the story culminates with a clever means of bringing broader glimpses of the world inside for her to enjoy. The colored-pencil illustrations mirror the story’s cozy feel with soft textures and clean white spaces. Youngsters looking longingly out the window but hesitating at the doorstep may find both a kindred spirit in and a gentle nudge from little narwhal.